Of transport, of trees, and of waterproofs that are not!! This was a walk of ‘wonderful’ 😉 weather, wonderful Dorset scenery, and some really interesting people along the way! You know, the more I walk, the more I look forward to meeting people on the path. There is something about being in the countryside – everyone you pass has a nod and a ‘hello’, and often they will stop for a chat as well, whether it be a farmer, the local vicar, the postman, or just another walker. Isn’t that really what life is all about! There is a lovely camaraderie in the country that you don’t find much in the towns, and people are just so interesting. One of the tings all the people I meet have a view on is the weather – well we’re English aren’t we! On this walk, it was a truck driver. He was parked up at a country crossroads in a somewhat difficult position and I thought he had broken down. We fell naturally into a conversation. Apparently he had come from Poole, picked up a load at Corfe Mullen, driven 100 miles to deliver it, picked up another load near his drop off point, driven 70 miles to where I saw him dropping off half the load. He was then going to drive another 50 miles to drop off the other half, picking up another load, and was then going to drive 500 miles to the Scottish border to drop that off! What a crazy life! The crossroads he was parked at is called ‘Four Ashes’, because there are four ash trees, one on each corner. 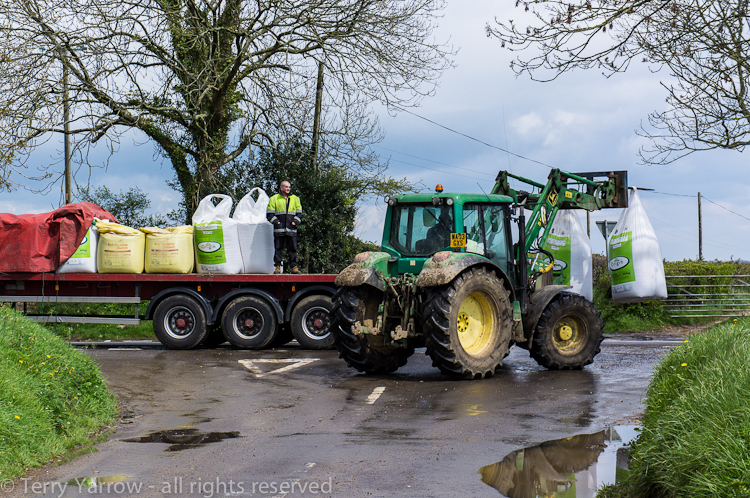 He was trying to deliver 12 bags of fertiliser to the local farm, but articulated lorries and country lanes don’t go together! 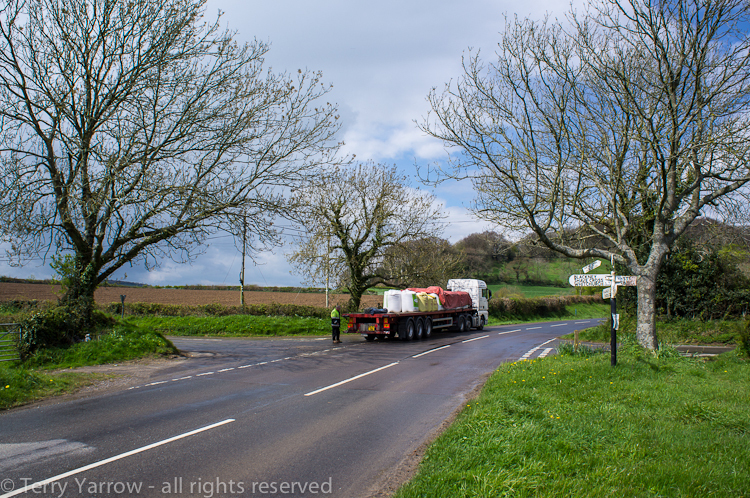 The only way to deliver it was to park up at the crossroads and for the farmer to bring his tractor and trailer up to collect it – which he finally did, and I moved on. 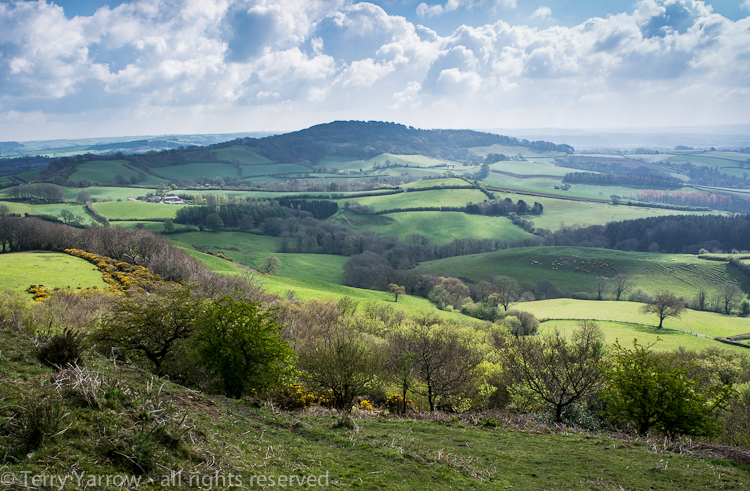 The scenery on this walk was simply stunning, that typical Dorset rolling countryside. It was a walk that took in a number of hill forts and the picture below shows one hill fort as viewed from another. In fact on top of one of the hill forts was a bull! He was on his own except for the hill sheep and I was a bit surprised because the land is owned by the National Trust and is open access land popular with walkers. As I have blogged before, that is technically not legal! I had my red cape with me but he didn’t seem very interested ;)!! Part of this walk took me through the most fantastic area of woodlands and at this time of the year with the sunlight slanting through a gap in the trees, the colours and tones of the Spring foliage really come alive. New life, and new growth, is everywhere! 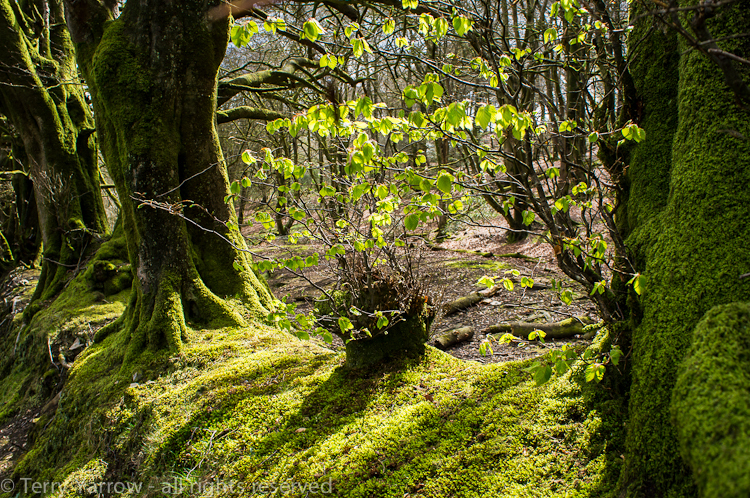 Don’t you just love the fabulous greens of the moss and lichen that cover these trees and bank! It is an interesting area and and as you walk through it, you just wonder about the millions of people who have passed that way before over the centuries since the line of trees and the bank are clearly an ancient boundary of some sort. If trees could talk! 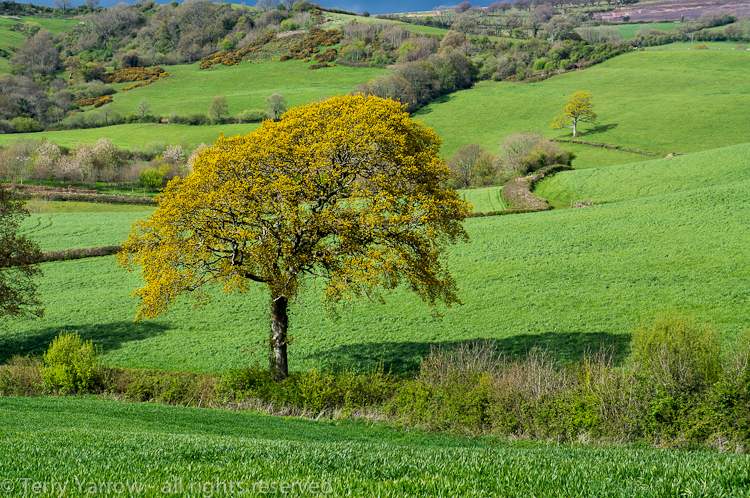 In that poem, Kilmer speaks of trees ‘living intimately with rain’ – well at the moment, The Dorset Rambler does too!! 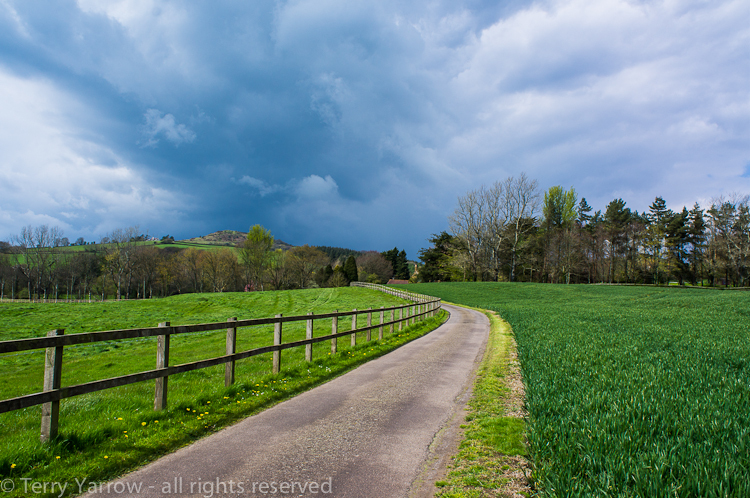 The weather for much of this walk was beautiful, but it was interspersed with really heavy bouts of rain and hail – it’s what I call ‘interesting’ weather ;)! Now I had my waterproofs, but I have discovered that they are not…….waterproof that is! The consequence was that I got literally wet through! So at the end of the walk I decided to reproof my walking gear, and I’m sure it won’t be long before I check to see if it has had the desired effect!! One of the side effects of all this rain is BIG boots! They start off a normal size 9 but some of the fields on this walk were MUDDY, and it was that thick clingy mud so that by the time you get to the other side your feet are size 30 and you have a job to lift them off the ground! Picture the scene – this silver haired man, soggy and wet through, unable any more to lift his heavy feet, on his hands and knees dragging himself across the field to reach the sanctuary of drier land on the other side ;)! Once there, there is usually a handy gate post ‘scraper’ nearby so they are soon back to normal size. Note to self – in future if it is wet, head for the chalky well drained hills ;)! 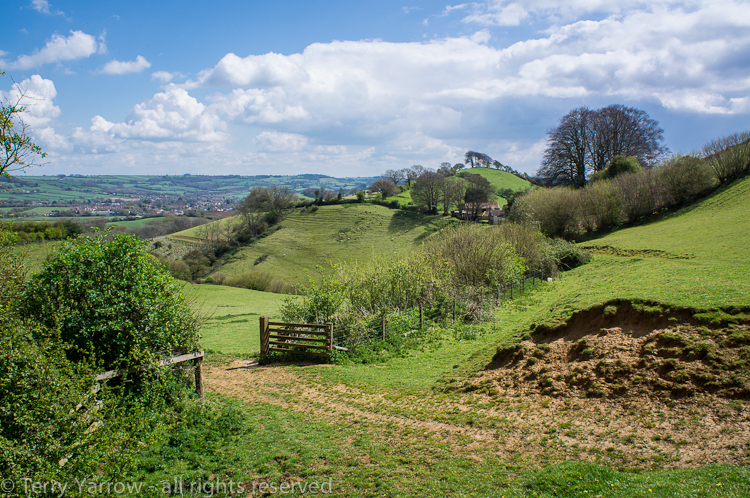 And talking of hills, there were a few of them on this walk too….steep ones! I climbed up this near vertical slope to reach the top of one ridge and just as I got there, a fighter plane on a training mission went over. He was clearly practising low level flying and I reckon he must have been only 10 feet above my head (well, that might be a slight exaggeration 😉 ) – it was deafening! Some good waterproof testing weather coming!! Ah, but the sun always shines again – and you can’t fully enjoy the sun unless you get the rain! Thanks again for visiting and reading the ramblings of The Dorset Rambler! Previous Some interesting weather, a new friend, and a mass trespass remembered! Next And where are the souls? Oh, I can’t believe this! I am so excited about your comments on trees and the sharing of Kilmer’s poem, because I am getting ready to post a slide show of my own Blue Spruce tree bringing out its new spring growth, and I spent all yesterday evening cataloging the photographs in preparation for that project! I truly am not a tree-hugger, but I do have a strong appreciation for them as part of God’s creation. He also has a great deal to say about trees in His Word, so they are very important to Him as well. And I do have to admit to a special love affair with my Blue Spruce. Every year I get excited about watching it bud and bring forth its new green garments. This year I decided to capture the process and share it. I even make reference to Kilmer’s poem as a conclusion to the slide show. What can I say? Great minds really do think alike! I enjoyed this journey just as much as the previous ones. You’re a brave soul to take on all of those walks in all kinds of weather. And your photos are just gorgeous. When I look at those rolling hills and those peaceful fields with the enticing gates, I feel this longing to just be there. And I was just thinking: This kind of journal would make an interesting book as well — particularly since your photography is very professional. Have you considered that possibility?